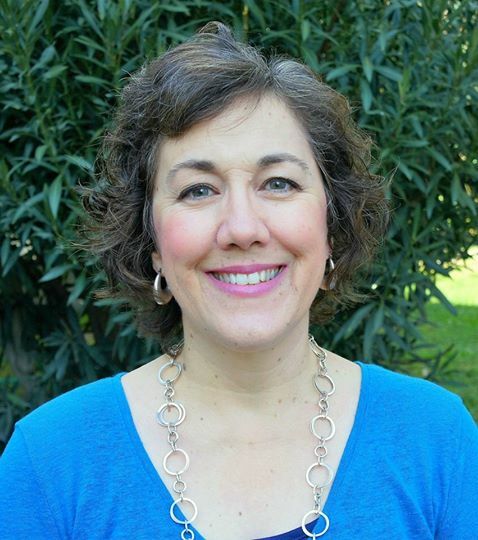 So blessed to have our sweet friend Betsy de Cruz guest-posting with us today for Part 4 of the “But God” Series. I trust her words will bless. Sometimes I feel like I’m making it through by the skin of my teeth. Just barely making deadlines and scrambling to get dinner on the table 15 minutes late. Just barely holding chaos at bay because I’m a wreck on wheels. He reaches down and speaks to me in the loveliest of ways right in the middle of my chaos. I’m the shopper who left her credit card at an Ikea cash register and realized it an hour later while trying to pay for groceries next door. Yes, I was THAT customer who systematically emptied the entire contents of her purse right there in the grocery store, looking for said credit card. I was also the only one trying to get a large shopping cart of groceries in that revolving entrance door at Ikea. “Excuse me, ma’am. You can’t bring that cart in here ,” said Mr. Ikea Man. Yes, that was me. The one politely arguing with Mr. IKea Man while shoving my cart in the door. I was also the one who pulled into our parking lot an hour later and realized she didn’t have keys to get into our apartment building. I wish I could say these were isolated incidents, but they’re not. Some days I feel like I live in a state of low-grade chaos. God reaches down and takes hold of me; He stops my spinning wheels and spinning thoughts. He reminds me I can slow down and breathe. I can rest in Him and receive His Love. As that thought came to mind, I stopped to rest for a minute. I let go of fretting about how to get into the building. 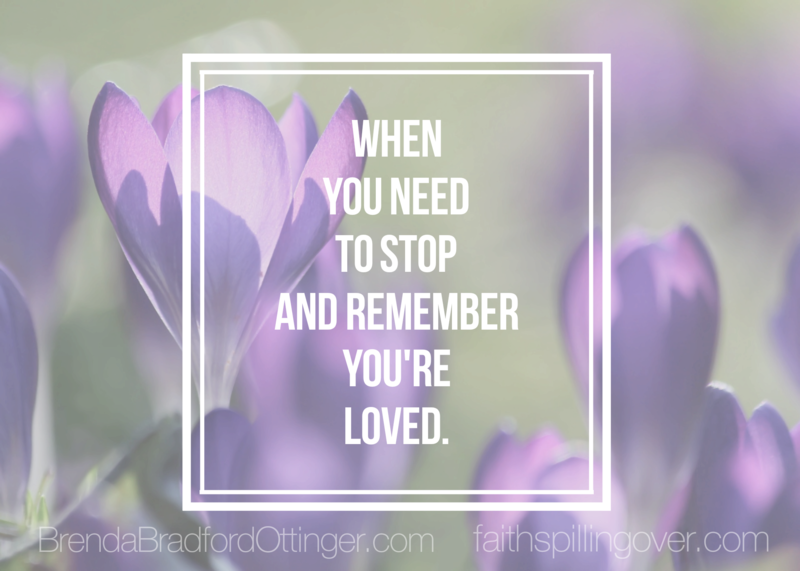 I stopped to remember that I’m loved with a never-ending love. I’m surrounded. Those few moments turned my day around. Chaos gave way to calm. As it turned out, someone had left the downstairs door ajar, so I got inside. Then my husband was unexpectedly home and opened the door to our apartment. Friend, I don’t know how fast your wheels are spinning today. Mine can get going pretty fast. Can’t we all use a little more peace and calm on our chaos days? What if we remember to stop every once in a while and invite God to come in and turn our day around? Let’s ask Him to turn our thoughts towards Him and His love for us. When we take a moment to lift our hearts and affirm our trust in God, His unfailing love surrounds us. Even when a bad day or a bad week tries to convince us otherwise, we are loved. When life gets chaotic, let’s invite God in to turn our day and turn our thoughts around. We can trust His unfailing love. 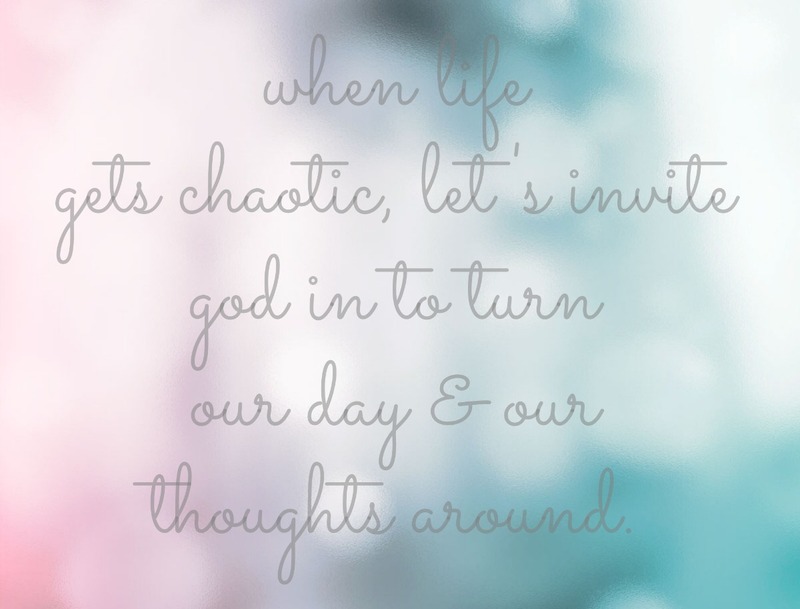 When life gets chaotic, let’s invite God in to turn our day & our thoughts around. Betsy de Cruz writes to encourage people to stick close to God, even when life gets bumpy and crazy. Most days she feels privileged to live with her family in the Middle East; other days she wants to pull her hair out and catch the next plane home. 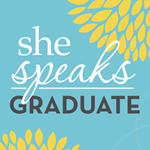 Betsy’s passion is to encourage women to get God’s Word in, so their faith can spill out. 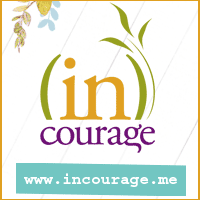 On her blog, Faithspillingover.com, you’ll find tips for Bible study, prayer, family life, and everyday faith. You’ll also find Betsy on Facebook, Pinterest, and Twitter. 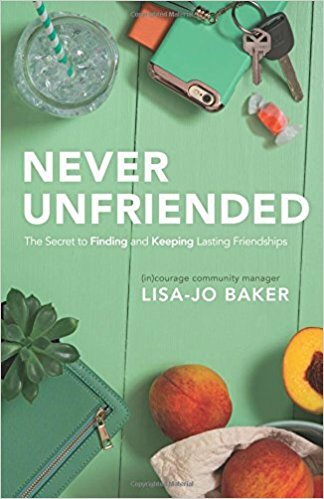 As a thank you for joining us today for Week 4 of the “But God” series, we’re gifting this beautifully written book by Lisa-Jo Baker — Never Unfriended. I’m blessed to be a humble part of Lisa-Jo’s launch team for this book, and friends–it’s such a worthy read. I wouldn’t say it if it wasn’t so. I look forward to sharing more about the book here in the near future, but wanted to share a copy of this blessing-in-word with one of you sweet readers. And Congrats! to our Week 3 Winner of the Jenny M. verse card set — Sarah Geringer ! Yay! Congratulations, Sarah! I hope you’ve all enjoyed the “But God” series as much as I have. Thank you to all of our sweet guest-posters who’ve made this such a special month of community. I plan to continue to this series in the future, so be on the lookout for future “But God” posts. With so much going on this week, I almost held off on announcing this, but it’ll be months before the opportunity arises again, so I figured we could stand one more bit of excitement this week. Announcing — 5th Week Fan-girls! Every month with five Thursdays, I thought we could spend the 5th Thursday showing the love to our fellow writers. In addition to linking up our own posts, let’s linkup a post that’s been a recent blessing to us from another site as well. Yay! Doesn’t that sound like fun?! So please, if you’re comfortable, feel free to link-up a post that’s been meaningful to you recently from another friend’s site this week! (As well as your own, of course.) #FanGirls! Please be sure to visit and comment on the post linked before yours–and others as you’re able. 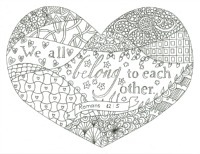 #ChasingCommunity Linkup — Add your post to the potluck! There’s room at the table for you. Oh gosh, sorry you’re feeling out of sorts, Liz. Yes, He is bigger than our chaos, and He loves YOU, friend! Fun finding you here, Betsy. And IKEA? Oh, girl! 🙂 Just this year the Lord’s been tapping at my heart, asking for more trust in these daily areas, so your post was timely.. Isn’t it funny how sometimes it’s easy to believe for big things, but stepping back and trusting in the small dailies seems somehow harder? 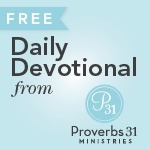 One thing is certain, small or large, daily or one-in-a-lifetime, God is trustworthy. (Btw, do they sell meatballs at your IKEA? Yum!) Thanks for opening up your beautiful pages here, Brenda. Hah! Yes, they sell meatballs at our Ikea! Yes, sometimes it’s the small dailies that get me tripped up and get my wheels spinning too fast in directions they shouldn’t be going! But God. He loves us so well, doesn’t He? Amen, Betsy! It gets crazy here almost daily. Isn’t it wonderful how spending time with God in the morning is our sustenance for the day ahead? He knows just what we need. I call it our daily bread for today. Yes, Kelly! I hadn’t even thought of it that way, but you’re right. Spending time with God in the morning prepares us for what’s ahead. Brenda, you just made my day! Happy to be a winner, and happy to link up with you and many other great writers! I’ll message you with my mailing address. Blessings to you, friend! Oh Betsy, yes, I’ve been in the low grade chaos valley … too many times to recall and often of my own making. You’re a hope sharer, here, there, everywhere! 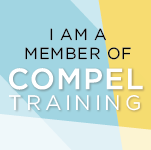 Linda Stoll recently posted…When Life Hands You Lemons . . . Thanks, Linda. You are a peace sharer. I so appreciate you. Good Morning Betsy & Brenda – Such a good post. This here > “He reaches down and speaks to me in the loveliest of ways right in the middle of my chaos.” It is in that moment that the chaos becomes the sweetest place of peace and order. Have a blessed Thursday, ladies! That’s right, Joanne! He brings peace and order to our thoughts and our schedules too, if we let Him. Betsy, I hope it’s not merely that misery loves company, but I sure appreciated your self-disclosure and then the encouragement that followed in this But-God piece. Sometimes I blame it on my age, other times I blame it on the ages of my kids with all their schedules, twists and turns each day, but it’s reassuring to me to know that God is able to provide a place of calm and peacefulness in the midst of all the chaos. Thanks, Brenda, for this series — and for the fan girl idea! Love it! Thanks for your encouragement, Michele. So good to know I’m not the only one here. 🙂 He is, indeed, able to provide a place of calm and peace. Even a tiny window in my day helps. Wow, that was some day you had – but I loved how you were still able to stop and focus on what’s truly important amongst it all! I’m sure you have days like that too, Lisa! He’s always there for us. I love knowing that I’m not the only one! It’s so easy to feel so very alone when the chaos spins, when I feel like I AM the chaos. But God….always. He’s there. He never called us chaos or mess up or failure. He calls us by who we are: loved, worthy, treasured, known. Sometimes it amazes me how very much He can know me and still love me. Betsy, how fun to see you here! I was nodding my head throughout this entire post say, “yes, yes. Me too.” I’m so thankful we serve a God who stretches out his loving arms to meet us in the middle of our mess and bring PEACE. And what a fun giveaway, Brenda. Thank you for hosting. I’ve heard so many good things about Lisa-Jo’s new book. Love it. I so see myself in the images you paint of kind of “Lucile Ball” types of days. I often feel like my life is a comedy routine or other days a horror movie. But, God. I need to ask God to reset my attitude not once, but several times in a day. It’s so easy for my thoughts to turn south. Perhaps that is to remind me how continually I need Him!! Hah! Lucille Ball days! You’re making me smile, Bev. I used to love that show, and it’s an apt description of some of my days. Glad I’m not the only one. We do need Him, and He always responds when we call. Wow-such fun-two of my favorite bloggers together! Betsy loved this and yes, we’ve all been there (maybe minus the grocery cart) 🙂 I love how God’s word come to me in a thought, a word from a friend or even out of my own mouth or keyboard when I’m encouraging others. But God says it all. Thanks Brenda for the series and sharing Betsy’s words today! What are you saying, Jill! That I’m the only one nervy enough to do that grocery cart routine?! Just kidding. You made me laugh. Yes, God’s word comes to us in so many ways. Blessings to you, friend. I love your reminder Betsy that the truth that we are loved has the power to change things. It definitely has the power to rewrite the lie that I failed or am not enough on the days when that feels like truth. Thank you for pointing us back to Jesus’ unconditional love for us. Betsy- you spoke to me girl! I thought I was the only one running around like a chicken with my head caught off. I love how you remembered God and His love and grace for you! Brenda- thanks for the book, I can’t to dive into it! Thanks for sharing this series! I can identify! If it weren’t for God I don’t know where I’d be! I really work at being organized and having “systems” (always put your keys in the same place) LOL … but somehow I can’t find what I’m looking for. Yesterday, in my attempts at efficiency and tidying up, I shredded a number I needed 5 min. later. But God … Thanks for the sweet reminder. BTW looking at your photo, I would have thought you were always calm and together! I have loved this series. 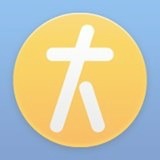 Thank you for hosting it on your blog. I look forward to seeing more. 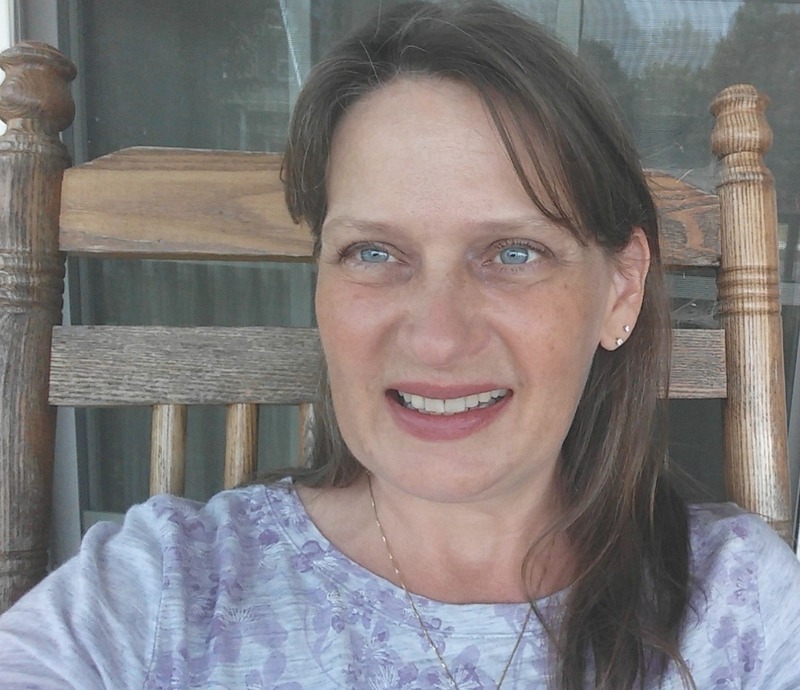 Maree Dee recently posted…Are You Judging Others In The Midst Of Mental Illness? What a great God we have. He loves us even when we don’t feel lovable or loving at all.